The Dream Shark is a third-party Sega Dreamcast controller released by Intec in 1999. The Dream Shark is similar in design to the Dream Master, with basic turbo features, and buttons, and coloured translucent shells, however the Dream Shark uses a more compacted design and rearranges some buttons. 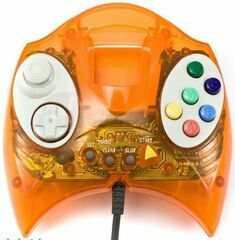 Three variants of this controller are known to exist, orange, purple and black. Yobo Entertainment picked up the design at a later stage and sold the controller as the C-9255 Advanced Controller.